It was 11 months ago that Fantastical made its iPhone debut and it blew everyone away. It got featured on almost all of our year-end lists in 2012. It was the best mobile calendar app until iOS 7 shipped. iOS 7 brought a new visual interface and many new interaction changes. Fantastical still worked fine but it started to show its age given the stiff competition. Flexibits announced that Fantastical 2 would be launching soon as a new app designed to take advantage of all the new shiny in iOS 7. Fantastical has constantly evolved since it launched on iPhone and Fantastical 2 improves upon everything and adds so much new stuff that it really makes the app go lightyears ahead of the competition. On first launch, you see the main interface has the same wireframe as before, but the visuals are more colourful and flat. The text content for events looks a lot more elegant than before. The linen bar on top has been replaced with a bright red bar across the app that can be seen in the icon as well. Speaking of the icon, The Iconfactory have hit it out of the park as usual. Fantastical had an amazing icon and Fantastical 2 builds upon that giving it a more playful look that looks stunning on your homescreen. There’s even a light theme for the events and edge swiping across the app to go back. It is very evident that given how iOS 7 looks and feels, most apps need to offer a light and dark theme. Fantastical 2 highlights today with a nice blue circle instead of the marker circle highlight in the previous version that is still there on the Mac version. The use of colours in Fantastical 2 is brilliant. There are also no gradient separaters in the event list. Those have been replaced with light hairline separaters. Most calendar apps still have the native look for events when you tap them because apps still use the built in iOS calendar integration. Fantastical 2 takes this to another level and everything looks absolutely gorgeous. One of the things I love most about the app is the birthday pages. I’ve linked Facebook to my iOS calendar just for birthdays and instead of displaying a boring page for birthdays, Fantastical 2 has a lovely animation controlled by parallax and a cake with a picture of your contact. There are options to call, message, tweet and post on facebook to wish the contact as well. Having a “last-minute gift” button at the bottom is genius. Even the about page in the app has a nice animation going on and it is clear how much effort went into this app. Flexibits really outdid themselves. I can’t wait to see what they bring to the iPad. 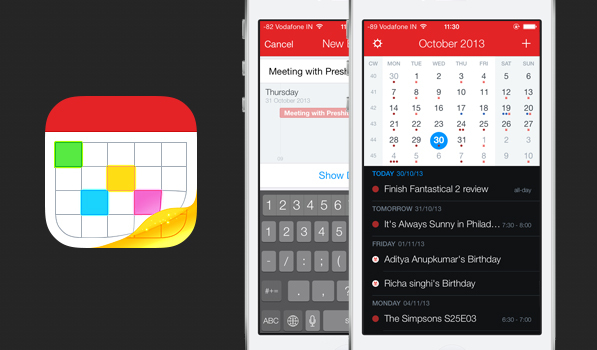 Fantastical 2 isn’t just about a stunning new look. Switching between the month view and the day picker has always been a vertical swipe down. The day picker now starts at the left for today instead of the middle like the old version. Tilting your phone into landscape mode reveals an all new week view that has a great animation from both the day picker and the month view. You can view your calendar week number and events in landscape now. Fantastical 2 also finally has full Reminders integration. You can create reminders by flipping the toggle on the new event entry page with geofences and through the natural language processing that we all love. The parser has improved a lot as well in the update with options to create recurring events with keywords like “last weekday of the month” and “the second Saturday of each month”. I don’t bother with the toggle for reminders because the parser will switch to reminders automatically when keywords like “todo” and “remind me to” are used during creation. iOS 7 brought background app refresh and Fantastical 2 is ready with your updated events whenever you launch it. 4″ iOS devices have an added feature in a special number row above the keyboard with 2 special keys that makes the event creation even easier and quicker. Having Text Expander Touch support is always great given how much I use it on OS X. There are also options for opening links in Google Chrome and locations in Google Maps instead of the stock apps. I love that the app goes the extra mile and tells you to disable notifications for Calendar events and Reminders for the stock apps to prevent duplicate notifications. Fantastical 2 brings a lot to the table and warrants a new app or paid upgrade. iOS 7 is seeing many developers go the route of new paid apps after offering multiple years of free updates. In this case, the previous version was out almost a year ago. The app still works perfectly on iOS 7 but looks out of place. Fantastical 2 isn’t just a reskin (Designers, if you complain about “reskins” being paid, do you even value your own work?). It adds a lot to an already best in class app. There are new features for power users and casual users both. I’m glad more developers are charging for their hardwork because that is the only way apps can sustain and developers are incentivized to keep creating apps that solve more problems. Fantastical 2 manages your calendar and reminders better than any other app or combination of apps and it does it while looking absolutely stunning. It is available at an introductory price of $2.99 for a limited time after which it will be $4.99 on the App Store.